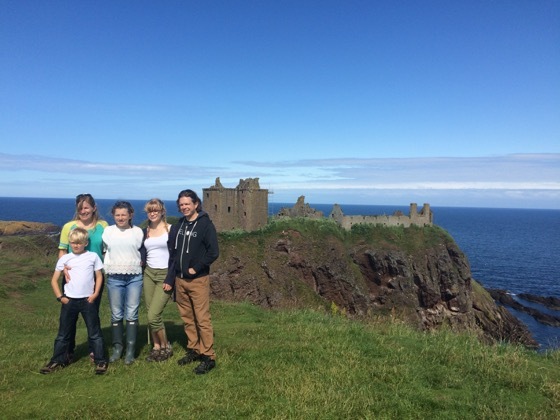 Our first excursion out of Aberdeen after our overseas move to Scotland was to a castle just outside of Stonehaven. We walked two miles down King Street from where we were staying as guests of a family who were back in the US at the time to Aberdeen’s city center to catch a bus. When the bus stopped on a quiet road near the castle ruin on a cliff, we were the only ones to get off. 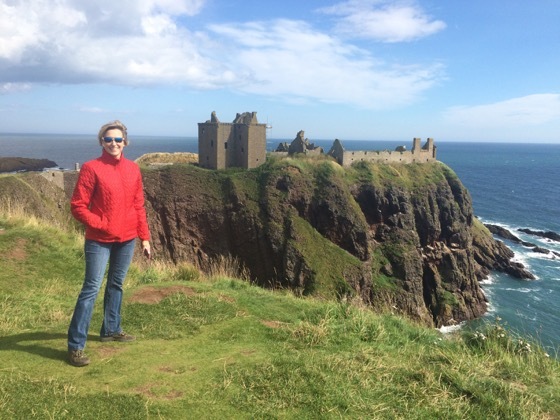 Dunnottar is dramatically perched on top of a rock that seems to rise out of the sea. Needless to say, we were impressed. 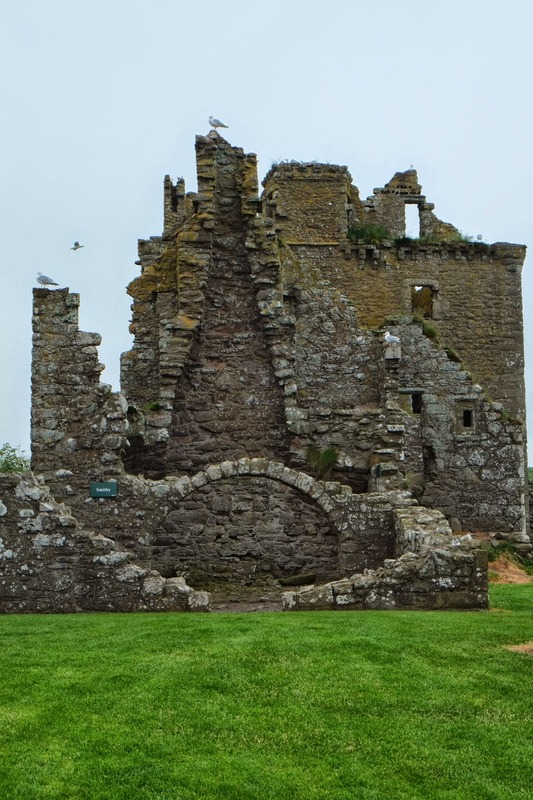 We spent a couple of hours touring and playing around the castle ruins before our tummies reminded us that we needed to find something to eat. 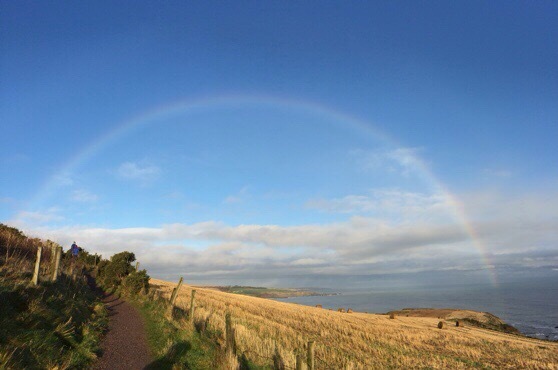 We walked the two mile road to Stonehaven, unaware of the gorgeous coastal path we could have taken by the sea. Some folks got a little tired of walking. 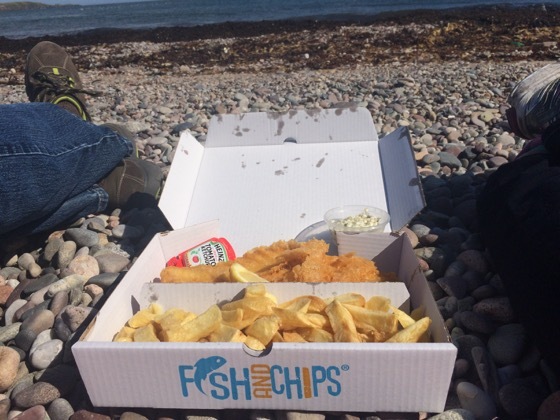 An hour later, we had found fish and chips and a beach to eat them on. We got back on the bus to head home to Aberdeen, tired and full and grateful for a wonderful day out to an epic location. 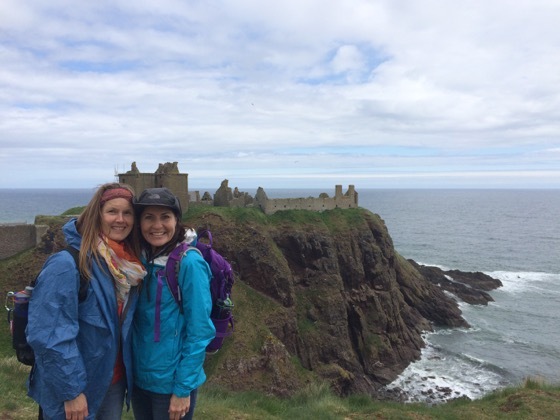 Over the last three years I’ve made many more trips to Stonehaven, and I never tire of watching the wonder wash across peoples’ faces when they glimpse the castle on the rocks or the delight in their eyes as we walk along the coastal path. Especially for Americans, there is nothing quite like walking around a grass clifftop through ruins that hold stories that are so very old. For over 800 years, these stones have withstood wind and rain and occasionally some sun. We usually get a little bit of everything on our walks to and from the castle. This rainbow and the darker clouds below are all from the same day. When I take visitors, we always walk around to the opposite cliff from the castle for photographs. You have to backtrack a bit and walk over a bridge though a gully to get over there. Here are a few of the photos from that spot that we’ve taken of sweet friends who’ve come to see us in Aberdeen! 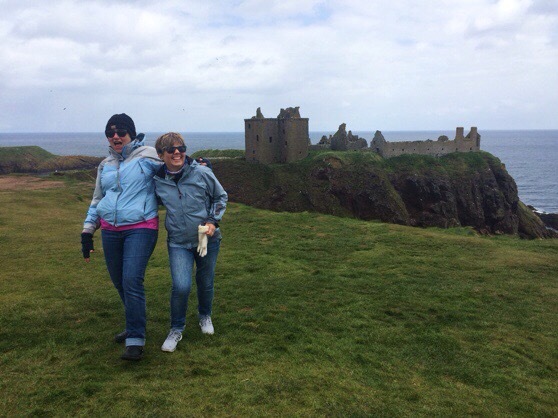 And my last trip to Dunnottar..Donna and Tanja, April 2016. 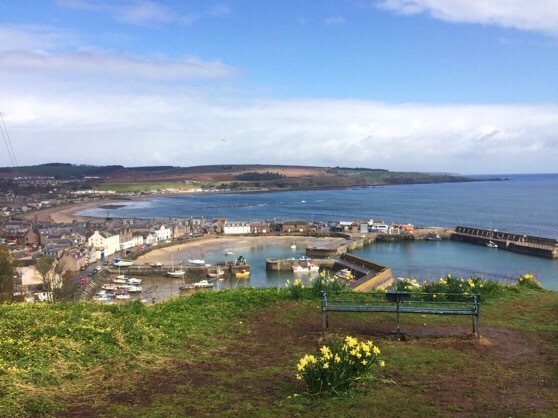 After we see the castle, we walk back to Stonehaven along the coast. The views as you come into the town capture the whole harbor and the beach to the far left where we often eat fish and chips. For lunch we have fish and chips on the beach, or we go to the Marine Hotel for beers and salmon chowder (Cullen Skink) and other cozy foods if the weather has turned. 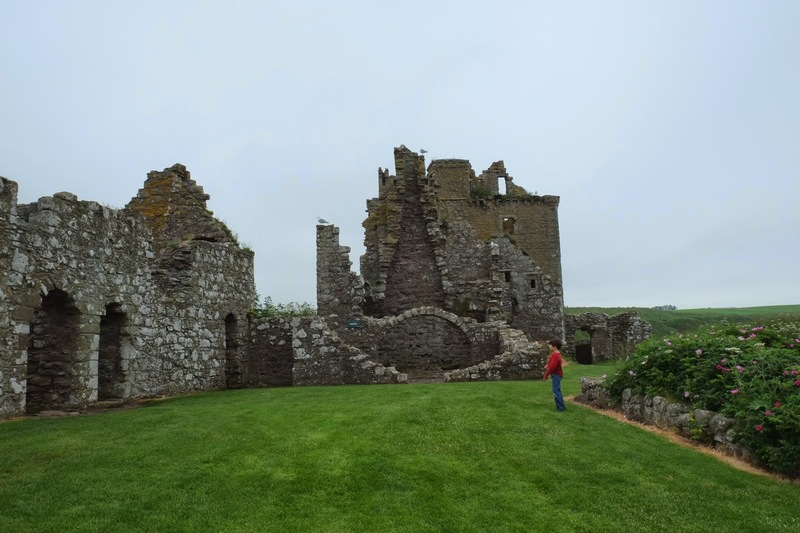 Stonehaven has been one of my very favorite day trips to make from Aberdeen and since it was our first outing in Scotland as a family, it will always hold a special place in our hearts! I’m so grateful I have gotten to share it with so many others! If you go…here are a few details I would have loved to know on my first trip there. You can park in Stonehaven right on the harbor (or in a free lot near the harbor) and follow the signs from the harbor to the coastal path. It’s 1.5 miles one way to the castle. When you reach the castle, there are a lot of stairs descending to the beach and then some more stairs up into the castle, so wear your hiking boots or trail runners. It cost around 7GBP to enter the castle ruins. There is a bathroom inside the castle which I always need when I get there. 🙂 And the fish and chip shop we love is the Carron. There’s no place to sit in, so we carry it across the street to the beach. But like I said, we also love the Marine Hotel right on the harbor for food and drinks. https://youtu.be/DE3LVaaPQIk Dunnotter from the air.